The GI 2QT. 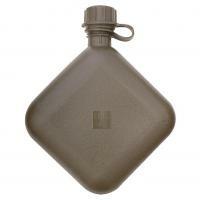 Collapsible Canteen from 5ive Star Gear is great for staying hydrated while on the trail. Despite its high volume, the canteen collapses down to a more compact size for convenient storage. The water bladder is made from durable, heavy-duty yet lightweight plastic. The material is formulated to be free of BPAs, ensuring users don't have to worry about potentially harmful chemicals bleeding off into drinking water. The screw cap fastens tightly to prevent contents from spilling or leaking and comes with a retainer strap to make it difficult to lose.